Start by aerating your lawn. If you don’t have one already, pick up a manual or powered lawn aerator from you nearest hardware store. Aeration does two things for your lawn. For one, it opens up the ground to allow water and nutrients from fertilizer down to the roots. 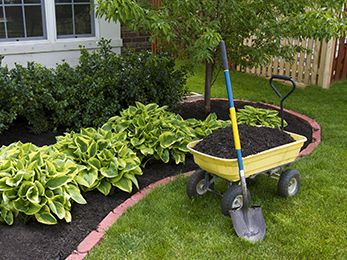 Over time, the dirt can compact from over use, restricting your lawn’s access to much needed nutrients. For another, the plugs of soil that come out during aeration can actually help decompose thatch left on your grass. Thatch is that leftover grass that comes after you mow the lawn. When left to rot, it blocks sunlight, water, and nutrients from reaching the live grass below. Aeration helps encourage its decomposition, freeing up the grass below to the much needed nutrients. Aerate your lawn to best prepare it for fertilization. When it comes to choosing your fertilizer, the difficulty comes to finding the one that will help your lawn best. Look for the following three macronutrients to help you make the decision: nitrogen, phosphorus, and potassium. Of the three, your grass needs nitrogen the most. Phosphorus comes next and potassium is at the bottom of the list. Look for bags that contain all three of those elements. Out of those options, choose the one that provides the most nitrogen first, then phosphorus, and finally potassium. Most warm-seasons grasses will need between 3 to 7 pounds of nitrogen per 1000 square feet. Come with an idea of how big your lawn is and purchase bags accordingly. You will want to fertilize your lawn at three times in the warmer months: just as it’s beginning to green up, mid-summer, and about a month and a half before your lawn hibernates. Be careful not to over-fertilize your grass. Every type of grass has a limit to how much it can take. Look up your type of grass on the internet and find out the proper care technique for your species. Once all of this has been accounted for, the time has come to fertilize your lawn. Keep to the following steps to ensure you do it well the first time. Only apply it when the grass is dry. Wet grass and fertilizer increase the opportunity for leaf burn (the browning of plants). Use a mechanical spreader to scatter the nutrients evenly along your field. Don’t do it by hand as it won’t spread evenly. Walk through your lawn like you would when you mow, being sure to overlap into the neighboring lane as you pass again. You want to make sure the lawn is properly fertilized from both directions. 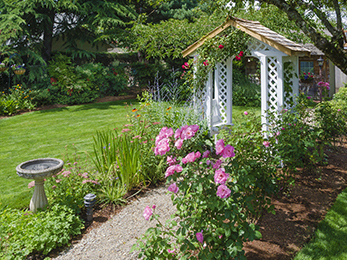 Once the lawn has been properly fertilized, water the applications thoroughly. When you do this in the right amounts, three times a year, you’ll enjoy a luscious, lively lawn to be proud of. 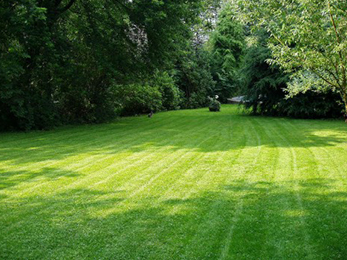 Those that hate cutting the grass though beware; you will be encouraging your lawn to grow faster and taller than ever. You will have to work hard to keep up with the demand. If you do not have time to care for your lawn properly, hiring a lawn care Wildwood MO or landscaping professional can remove the guesswork and free up your weekends for more exciting endeavors.